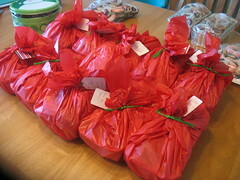 Is there anything better than baking up some goodies, wrapping them up, and sharing them with friends and family? Stay tuned for photos of the individual cookies, and the recipes! YUM!